Goldfinch (Carduelis carduelis). Taken at Otmoor, Oxon., on February 1st 2015. Taken at Otmoor, Oxon., on February 1st 2015. Goldfinch (Carduelis carduelis). Juvenile. Taken at Abingdon, Oxon., on September 5th 2013. Juvenile. Taken at Abingdon, Oxon., on September 5th 2013. The Goldfinch is a highly coloured finch with a bright red face, black crown, white cheeks, breast and belly, and yellow wing patches. The sexes are alike. It is found throughout the British Isles except for north-west Scotland. It breeds in low-lying deciduous woodland, pine plantations and orchards. It has become much more common in gardens with the introduction of Nyger seed feeders. 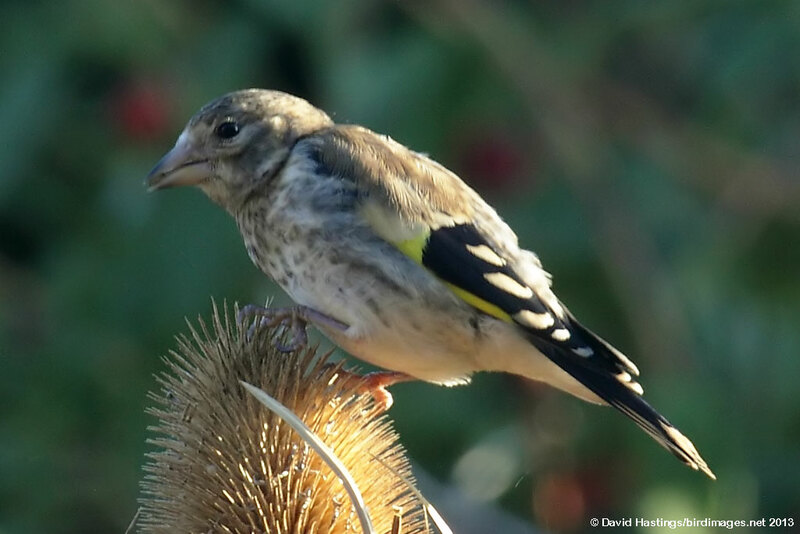 Most British Goldfinches spend the winter in southern and western Europe. There are about 313000 territories. Only about 100000 birds spend the winter in the UK.